The continual introduction of the latest technology in the outdoor advertising has made us the trademark outdoor advertising company in Ahmedabad, on which customers have foremost trust, is an outcome of our passion to go an extra mile to introduce exclusive ways of grabbing that extra attention required to make your brand stands apart. We take pride in our achievement in the digital billboard in Ahmedabad that is guaranteed to be the 100% effective platform for the outdoor advertising and make your every advertisement considered in the crowded area. Unlikely to television and radio, a digital billboard in Ahmedabad promotes your brand 24/7, and hence is becoming the best bet to grab that extra attention at low cost. Our digital billboard is available at different locations of Ahmedabad, so as one can select the location that is ideal for their product or service. What exactly the digital billboard is, a common question for the newbie is a simply computed controlled LED display which provides an attention-grabbing display, if executed ingeniously and is what we have gained through elongated experience in the outdoor advertising in Ahmedabad. The deep know-how of the digital billboard and it’s technology entitle us to carry off the Cristal clear display and the ideal incorporation of the color and brightness to grapple every roadside consumer rather than annoy, which makes us the favored outdoor advertising company in Ahmedabad for broadcasting the brand identity digitally. 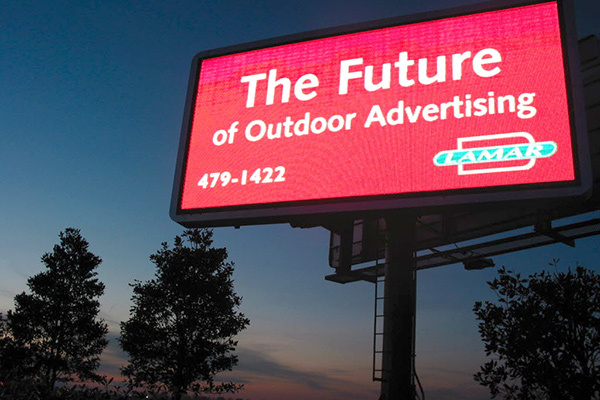 Interested consumers in the digital billboard are permitted to change the messages across the contract period as well as advertise more than one message in the cycle. In addition to images, videos from the client side are welcomed to display on the digital billboard in Ahmedabad, there are no constraints on a number of images or videos, which users can privilege throughout the contract period without any hesitation and magnify consumers in the shortest time. Unlikely to print a significant number of posters for the different locations, digital billboard requires electronic images or video to display at the different locations, apparently slashes the cost of printing and hence it is proven to be inexpensive for consumers. As it is possible to electronically upload the created images or video, it requires very less time to upload and start promotion by means of the digital billboards. It is easy and instantaneous task to change the image or video on the digital billboard as well as stop or start advertisement and hence is the best bet for the long advertisement and also for short advertisement. You know your audience and timing when they are outside, which you can leverage by digital advertising. Yes, you can select the time of advertising on the digital billboard which you determine the most lucrative and grab the highest possible audience in that time span with an ease. One can easily change the image or video as the time change to convey the right message at the right time to the right audience, which is the right mantra of grabbing maximum consumers. Promote your brand with the video 24/7 is now possible with the digital billboard, simply upload the video on the digital billboard and start to advertise.